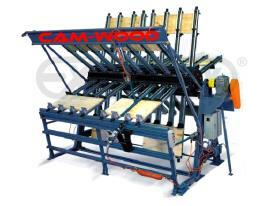 8-Section Pneumatic Clamp Carrier with 125" width capacity. (8) Heavy Duty zinc plated clamps per section (64 clamps total). Jaw sizes of clamps are 3-1/2" with inward draft. Pneumatic clamp tightener and 1/2 HP electric motor rotation. Heavy-duty zinc-plated clamp with huge 3/4" diameter jack bolt for super strength. Powerful caterpillar chain drive for clamp rotation. Select switch control for auto or manual mode. (2) Clamp tighteners with pneumatic wrench for rapid tightening and loosening of clamp. (2) Pneumatic panel flatteners to hold panels flat while clamps are tightened. Versatile and reliable Edge Gluing Machine for Solid Wood gluing, including laminate board, parquet, flat stock, table top, core block, truck flooring, turnings, chair seat, legs, spindle blanks, stair tread, and many others. Comments: 40" Wide clamps and dual tigthtener and panel flattener!